“Manchester’s Project” – He sold property on a Friday and on the next Tuesday, the City Council approved its construction. To outsiders, Mission Valley at times feels like it’s in its own intense universe. Other times, it seems like San Diego’s own “black hole”- once you enter Mission Valley, you immediately get swept into its traffic craziness and grid-lock. But what happens in Mission Valley deeply affects the rest of San Diego, especially the coastal areas directly to the west – like Ocean Beach, the Peninsula, Mission Beach, PB – but also other nearby communities such as Clairemont and Grantville. Because of this close proximity these other communities are impacted by both the increases in population and density in Mission Valley and – due to the lack of infrastructure in the valley – are also impacted by strains on their infrastructure. In quick succession you’d swear was intentionally planned, Doug Manchester, the former U-T publisher, sold the San Diego Union-Tribune property in Mission Valley on Friday, September 11th. It’s the property that includes the site of a planned massive complex with two seven-story apartment towers for a total of 200-unit apartments. Then on the following Tuesday after the sale, on September 15, the San Diego City Council unanimously approved the construction of the massive complex. This complex is one of the four huge development projects – and a handful of smaller ones – either planned or already in construction – that we have identified as coming down the Mission Valley pipeline. When completed, they will double dnd triple the valley’s population and residential units, without simultaneous, parallel and proportionate construction of an infrastructure to go along with the construction boom. These projects coming to Mission Valley, we feel, will complete its destruction. Manchester sold the nearly 12.9 acre site to BBL Commercial Real Estate, headed by Casey Brown, for more than $50 million. Just south of Fashion Valley, at 350 Camino de la Reina, the property just sold also includes – besides the planned complex – the 5-story UT office building and an adjacent building that held the former paper’s printing presses – now dismantled. When Manchester sold the newspaper to the LA Times parent company, he retained the land and the buildings. With Council approval now behind them, the new owner of the complex – Casey Brown’s BBL – is ready to start construction during the summer of 2016 and plans its completion by 2018, at a tune of $60 million. In addition, a large parking garage is sketched out in the drawings, an entrance is planned along Camino de la Reina, and a small pocket park is also mapped out. Earlier approved by the San Diego Planning Commission, the project had stalled due to a legal appeal by the Coastal Environmental Rights Foundation (CERF). The City Council action ignored the appeal and threatened legal suit against the City by CERF. In June of this year, the Coastal Environmental Rights Foundation (CERF) appealed the San Diego Planning Commission’s approval over claims that the city failed to use accurate greenhouse-gas emission estimates and instead fudged the numbers to save Manchester, and other developers, from having to perform any air-quality mitigation measures. Doug Manchester’s luxury housing and commercial project: this is one of the most significant of the new developments coming down the pipeline. … Scaled down from its original outrageous design (which included a 22-story tower and a 10-story office building), the current blue-prints call for a bulky and massive mid-rise residential structure with hundreds of residential units where the parking lot is now near the San Diego River. The residential structure steps down from 7 stories at the south end to 2 stories at the north end, with parking included on the first two levels. The development for the near 13 acre site also includes 243,700 square feet of office space, 5,000 for restaurants, and nearly 6,800 for retail. The current plan also includes a whopping eight-tenths of an acre for a park along the river. If you think this project will never be built, think again. Manchester now has his man on the San Diego Planning Commission with Mayor Faulconer’s appointment of Doug Austin. Before he took his chair on the powerful Commission, Austin had been hired by Manchester to be his chief architect for the Mission Valley project. “Mission Valley’s importance to San Diego cannot be understated. Former farmland has given way to businesses, tourists and residents of today. The common denominator over time has been the San Diego River, a treasured body of water for everyone.” – Randi Coopersmith, whose Latitude 33 planning and engineering firm worked on the project. Ground has finally broken on a 14 plus acre park in the middle of Civita – the gigantic 230-acre Sudberry Properties planned city-with-a-city project that was begun in 2010. The park – or at least the first of 4 phases – is scheduled to be completed by 2017. Civita is the largest new development in the middle of Mission Valley located north of Friars Road between Mission Center Road and Qualcomm Way. The $2 billion planned project will add 10,000 to 15,000 new residents to the valley, and will include nearly a million square feet of office and retail space. Mission Valley is recognized as being park-starved, even by the San Diego U-T . And these very beginnings of the park development at Civita is being heralded as “a new public playland”, that will include 10 acres of play fields, two basketball half-courts, a community garden, rose gardens, an outdoor grassy amphitheater and a 100-foot flagpole as a tribute to the military – just the first phase. For $15 million. Radelow also asserted that the park will include a dry stream bed and walking trail along the western edge. According to the PR, the “natural streambed” will act as a biofiltration system to collect and filter storm-water runoff before it flows into the San Diego River and out to the ocean. Other features include its multi-levels that will “cascade down” the 160 foot drop in elevation at the former rock quarry site, and a tree-sheltered promenade. And they plan “a recirculating interactive water feature” and a game area with chess, ping pong, and a grassy play area. Sudberry also asserts that a water treatment plant will eventually be built that produces recycled water from the homes and commercial buildings that is recycled for irrigation. 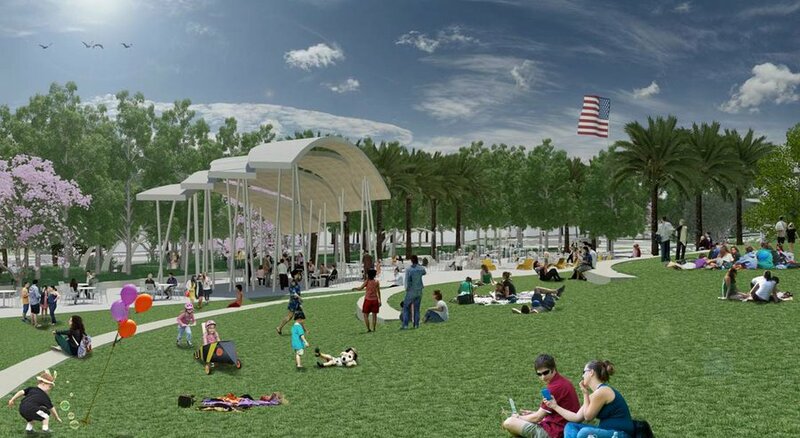 Once completed – the new park in its first phase – will be Mission Valley’s largest park. And it will be turned over to the City of San Diego to maintain. Restrooms will be in the 2nd phase, along with children’s play areas, a dog park, a picnic grove and interpretive gardens are all claimed. They also assert the entire park will be completed in 2018. It’s also claimed by Sudberry officials and their consultants that “hundreds of residents” participated in coming up with the park’s elements. One issue that is bound to bubble up will be just how much access to the park will other non-Civita residents in Mission Valley have? The very first hotel in Mission Valley – opened by Charles Brown in 1953 – was a 46-room motor inn. His son, Terry Brown developed a convention center and a 10-story hotel tower which opened in 1970. And for the last 60 years, the Brown family’s Atlas Hotels, Inc. have run the place. In 2014, Atlas Hotels joined up with Lowe Enterprises from LA and AECOM Capital to own and operate the 40-acre property, to “reposition” it in a changing convention world. By the time the ambitious makeover is completed in early 2018, about a third of the current structures will have been bulldozed and in their place will be a grand new entryway and lobby, three new restaurants, a spa and, in the center of it all, a 2-acre water attraction, complete with a sandy beach, slides, waterfalls and a lazy river-style pool. Also envisioned, although further off from being realized, are plans to develop on the eastern and southern fringes of the property four residential towers with more than 600 apartments that would coexist with Town and Country’s hospitality and convention facilities. As part of an entirely new master plan for the property, the hotel’s current 935 rooms, spread among two towers and low-rise bungalow-style complexes, would be trimmed to 688. The project’s overall master plan still needs to be approved through a potentially lengthy vetting process. This will determine how fast the resort’s reconstruction occurs. This development was also identified as one of the 4 major projects and handful of minor projects that will permanently alter Mission Valley in its journey to final destruction. Stay tuned for the next episode of The Citizens’ Watch of Mission Valley. I mean, creating the likes of so-called pocket parks, in a valley that was itself once a vast natural river park? Ridiculous!! Amen to Gormlie’s article, and T.H. Bear’s comments on THE BLACK HOLE. Mission Valley is a prison complex, now featuring an exercise yard. It is the lasting reminder of a city’s sellout of its treasure. Others have come along since — East Pillage and Sports Arena’s chain of strip malls and Big Boxes come to mind — but it is Mission Valley that has become the city’s burden and hex, a record of greed and corrupt governance that will probably be repeated when the golf courses are gobbled up and tenemented with brick five stories containing cells the unwitting purchased at $550 per sq.ft. The city charter states that we are supposed to have a regional park around or near the Jack Murphy Stadium. It never happened. (Mission Valley News, San Diego, CA) – While Mission Valley is well known for its plentiful shopping, fantastic restaurants, quality office buildings and extraordinary housing options, the locals know its secrets. And there are many, from paths along the river, a special garden and the funky glass elevator to Carl’s Jr.
One of my favorite secrets is Sefton Park where the Presidio Little League plays and where I have attended many games. Tucked along the banks of the San Diego River as it passes below Presidio Park, the park features five ball fields and has been hosting teams since 1970. It is named in honor of the J.W. Sefton family, one of San Diego’s oldest and most generous. The J.W. Sefton Foundation has been instrumental in keeping Little League baseball in Mission Valley the last 38 years. In 2004, the league became part of the San Diego Padres’ “Little Padres: Park Program” started by John Moores and received major upgrades. The fields at Sefton Park are named for volunteers who have given generously of their time and energy to ensure that Little League Baseball maintains a place in Mission Valley. Those men are the late Scott Palmer, who managed the park’s first seniors’ team and had a great connection to the youngest players struggling to learn the game; Art Bishop, the original visionary of Sefton Park; the late Ed Luce, who coached and managed teams for 35 years; and Jack Hacker, who coached and managed teams for more than 38 years. The T-ball field is named for past league President Ron Carrico who served the league for more than 10 years. This past fall, the County of San Diego was able to assist in the funding of a new type of synthetic turf for the infield of three of the five infields. Manufactured by a German company, the turf is of high quality and of a new design. Because the park’s location is so close to the river, flooding is a major issue, and one that can wreak much damage. During this year’s prodigious rains, I worried the newly installed turf would float away. You can imagine my relief when I drove over and saw it stayed firmly in place, and witnessed the great job the league’s volunteers had done in protecting the rest of the field and restoring what had been damaged. With baseball season now beginning, League President Bruce Bourdon tells me the players absolutely love the new surface. It has a true hop which lessens any fear of the ball for the 6 to 12 year olds and it is easy to dive for balls almost out of reach. Coaches love it because the maintenance is so easy. There’s no mowing, no raking, no leveling and no flooding from stuck sprinkler heads. The turf also has greatly reduced water consumption. The synthetic turf is expected to last 12-15 years. I look forward to little leaguers enjoying it for years to come, and for generations to freely share in the secret of Sefton Park. Now go play ball! San Diego County Supervisor Ron Roberts’ Fourth District includes Mission Valley and its surrounding communities. You can reach him at ron-roberts@sdcounty.ca.gov or find him on Facebook by searching Ron Roberts. This article originally appeared in Mission Valley News (a media partner of SDNR). Interesting that Sefton Field was only dedicated as park land in 2009. Kind of a good way of reducing the park requirements for the rest of the developments coming along. And, considering that this is configured as Little League fields, I don’t see how it qualifies as a general use park. 1. Buy a property at a low ball price. 2. Bribe politicians to upzone the property aka creating new “zoning entitlements”. 3. Sell the property off to other developers for far more money than you paid for it, making yourself much richer. All this business model requires are crooked politicians who are willing to upzone any property in return for “campaign contributions”. On top of all of this they want to build a new stadium, along with any structures they please. Traffic is a nightmare, they were allowed to build without schools or parks. Sefton is a baseball field, not a regional park, and difficult to access. Well, I am glad that there are others that agree with me. I thought I was alone. I only go to Mission Valley when I have no other choice – an appointment – a friend’s insistance to go to a restaurant…….It fills me with dread just heading over there from Hillcrest, down the l63. Where am I going? I have my gps set otherwise I would be going in circles through that horrible traffic. It is totally confusing, It is such a mishmash of buildings and parking lots. I appreciate others’ comments.